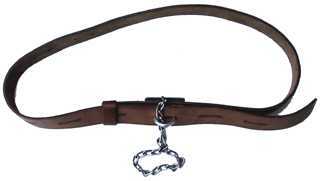 This Transport Belt is a simple length of leather with slots and a hasp. The chain is a loop. One point of the chain is fixed to the hasp. Once the belt has been applied, the chain is pulled THROUGH the hasp and the cuffs are then passed through the chain loop. Once locked on, the chain cannot be moved back out of the hasp and thus the belt is locked on.